Learn time honored techniques about how to use crystal energy. In part one of Crystal Energy we discussed the fundamental principles at work when we bring crystals into our energy field. We talked about the importance of engaging our intuition to choose specific crystals to work with on any given issue, be it physical, emotional or spiritual. Now, let’s have a look at some other interesting elements that make crystals, minerals and stones a truly magical andpractical process that can be utilized for the benefit of us all! I think it bears repeating that crystals and minerals are electromagnetic in nature and that what they do is find resonance with whatever comes into their own EME (electromagnetic energy) field. In this piece what we are concerned with is how they interact with us. Keep in mind that we are literally electromagnetic in nature! Therefore one can reason that crystals most certainly have the ability to find resonance with the biological system and quite literally – they do! But just what are they finding resonance with? Let’s start with a baseline assumption that we as human beings have everything (literally everything) already within us, physiologically, psychologically and spiritually – to solve, heal, attract or repel. This includes the ability to manifest circumstances on the physical plane to healing our bodies of dis-ease, and everything in between. There are steps we can take that will help us to activate and utilize each and every one of these qualities. Due to a number of factors over the course of our development however, most of us lost easy access to many of these faculties, save for a handful of spiritual adepts who are said to have the ability to call up many of these qualities, including the act of materializing physical objects – at will! So it’s safe to assume that these qualities within us have gone largely dormant. Remember that our brain only processes a tiny, tiny fraction of information on a conscious level – 5-9 bits, roughly. What crystals represent in this case are tools to help us activate some of this “unconscious” information. I want to stress that we are an energy source in and of ourselves and crystals represent the medium – the tool to help us activate and in some cases, restructure that energy. Due to the fact that each crystal (according to its internal crystalline/molecular structure) corresponds to different frequency sets within the electromagnetic spectrum and again, going with the assumption that we carry these same frequencies, the crystals tune themselves according to the corresponding area that needs addressing. This will happen by default. The given area will be activated within the recipient and the physical law of resonance kicks in. Now the issue is brought to the fore and ready to be dealt with. However, the critical factor is that we then use our mental and emotional energies to shape the results we are trying to achieve (thoughts and feelings are also electromagnetic in nature) to bring about the solution. It is really you who are doing the healing, the solving, the creating – the crystal is simply the conduit to help you activate the process! Just what does clearing a crystal mean? Our modern texts talk about the myriad ways in which we can clear or cleanse crystals prior to working with them. Whether putting them in salt or salt water, in the earth (where most of them come from), in sunlight or moonlight or running them through sage smoke (also known as smudging), I suppose many of these can be somewhat effective. However, here’s what I’ve found to be the most effective and the least talked about in my own research. Sound Vibration! Yes, sound is probably the most effective, quickest and strongest way to get a crystal back to its base resonant frequency. And that’s what “clearing” means. It has been said, although still somewhat ambiguous, that crystals do not absorb or hold an energy pattern – rather, energy will pass through crystals and the crystal will either vibrate with the energy field it comes into contact with, or it won’t. In using sound vibration, what you will do is break the current pattern the crystal is vibrating with, much like you would do if you were to stop a pendulum from oscillating if you were to simply put your hand on it to stop it from moving. That’s it! The louder the sound – whether it is coming from striking a loud key of C on the piano or putting your crystal in front of a speaker playing loud music or emitting a loud sound from your mouth, the vibration being emitted from the sound (we’ve all felt the vibrations of loud sounds in our own body) will interrupt the crystal’s current pattern of oscillation and reset it to its baseline frequency. This is a most effective (and quick) way to clear a crystal, from my perspective. However, again, I encourage you to experiment on your own! Here’s a little anecdote that I thought was worth sharing. 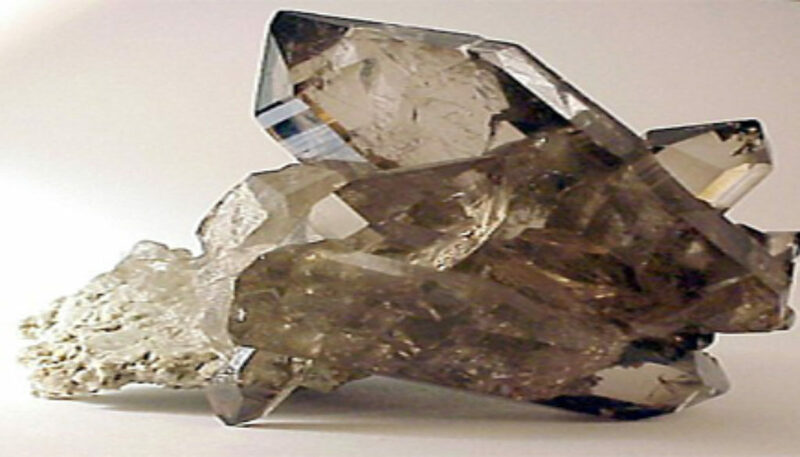 I have a wonderful crystal that is called ametrine (a combination of amethyst and citrine). I have used this stone to help with mild cases of insomnia, where I would literally lean the stone against the small of my back while in bed, and in most every case of using it in this way, I would be fast asleep within 10 minutes!! Now, I must say that I do not know where I got the idea to utilize the ametrine in this way – I’ll have to assume, I was simply drawn to do so! Nonetheless, one night I decided to cleanse the stone under the light of the full moon. I’d never done this before and had never even cleared this particular crystal by any method. After leaving it in full moonlight for the night, the following night I again placed the crystal in its usual position and what happened?? I was awake all night, tossing and turning as if having three cups of coffee just prior to bed. What was going on here? This again, was purely experimental. And this is why I do advocate trying out these things on your own, without the aid of a book, so you can determine whether the effects you are experiencing are clearly yours or assumptions based on what you’ve read or heard. It seems, that what happened is that by receiving strong light energy (which is information) from the moon, that rather than clear the ametrine, it charged it – somehow reversing the effect its native attributes had on my own system. Needless to say, that crystal will never see the light of the moon again!! Here’s another inclination I had, simply to demonstrate to myself the stability and inherent patterns of certain crystals. We spoke of a pendulum as another tool to demonstrate oscillation. Many use pendulums (some are made of crystals) to “dowse” or divine answers to certain questions or problems. What I have done is taken a given crystal or set of different crystals and one at a time I will place the pendulum about 2 inches above the crystal and simply watch the direction or intensity that the pendulum will move. I found it fascinating that each crystal emitted its own unique movement associated with the pendulum – whether the movement was an oscillation (back and forth), clockwise or counterclockwise motion. Some movements were rather subtle, others clearly pronounced, depending on the crystal. What made this little experiment even more intriguing was the fact that each time I came back to a given crystal, whether an hour, a day or a week later, the same fundamental movement occurred proving to me that crystals do carry their own unique signature! It is said that our feet are perhaps the most sensitive part of our bodies. In Chinese medicine, the acupressure points are used on the feet to identify and treat many ailments. Reflexology has become a popular method in using as a subtle energetic modality. Again, purely experimental, what I have done is taken a crystal, specifically a clear quartz crystal wand, and while holding the wand with its larger end facing the soles of my feet, I simply scan different parts of the foot, without the wand actually touching the foot. As I move the wand back and forth, I can feel certain subtle pulses, vibrations or “tickles” depending on where the wand is located on the foot. 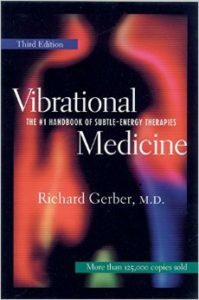 Sometimes I have been able to pick up a vibration in another part of my body while holding the wand at a certain area, say the big toe or heel, for instance. To test the accuracy of the sensation, I will simply run the wand back and forth in the area where the vibration is concentrated and interestingly I can feel the energy moving back and forth in perfect accord with the movement of the wand! This simply demonstrated to me that we are clearly having a definite electromagnetic interaction with our crystals. In part one of this article, I mentioned my reverence for the scientific method relative to how and why crystals work, although one should leave room for the mystery at the other end of the spectrum. I have admittedly had a handful of what I would call anomalous experiences with several of my crystals that elude me ‘til this day. 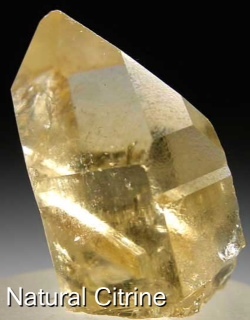 On one occasion, I had been working with a medium sized *pure citrine crystal while gazing into its structure, noticing the beautiful rainbows and inclusions it had throughout. I found myself pulling the crystal closer to my eyes while being more and more entranced with its beauty. All of a sudden a three dimensional image of my mother (who passed over a decade ago), formed right in front of my eyes within the crystal! The features were unmistakable. I could even see expression on her face as if she were looking right at me! The image was so distinct, it startled me! I had never had an experience quite like this and certainly not with a crystal! It’s as if the crystal became a holographic plate, imprinting what appeared to be a 3D image of my mother’s face within its structure. I later went back to the crystal to see if I could “find her” again, but to no avail! This, I suppose was a once in a lifetime occurrence. I do not know what prompted the experience but I do know that it was an authentic albeit mysterious one! 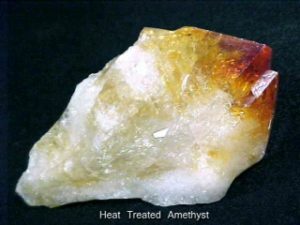 *Note that some citrines are actually heat treated amethyst and not citrine in the truest sense. On another occasion I had been simply spending time with some of my crystals and stones that I had placed around one of the rooms in my home. Periodically, I like to pick up different crystals and try to sense if there’s anything I should know about them, energetically or otherwise. Upon picking up a large jasper stone, I heard (telepathically), although loud and emphatic, “SHAKTI!”Again, I was taken aback at the spontaneity of this message. I did not expect to get such a definitive communication. But it was just one word and it was clear – Shakti! Derived from Sanskrit, Shakti is the concept, or personification, of divine feminine creative power, sometimes referred to as ‘The Great Divine Mother’ in Hinduism. On the earthly plane, Shakti most actively manifests through female embodiment and creativity/fertility, though it is also present in males in its potential, unmanifest form. (source: Wikipedia). After hearing the word shakti and knowing somewhat of its meaning, I then went to my crystal reference book (A great time to use books is after you have a direct experience with a crystal to see if it correlates), and among one of the attributes listed in this particular book for jasper: feminine energy – SHAKTI!Enough said! On that same day, I took a specimen of adamite (a zinc arsenate mineral with an orthorhombic crystalline structure), and held it in my hand, eyes closed. I focused on an image of a candle flame in my mind’s eye – I did this simply to clear my mind of any conscious thoughts that might creep in. Again, out of the blue, I found myself viewing a scene. First I saw what looked to be a barren desert, but then the scene shifted quickly to that of a “jungle-like” environment complete with an image of a leopard! I was floored by the distinctiveness of the scene and even more intrigued by how the images morphed from one scene to another, like it was trying to tell me a story! Off I went to my book source to see where deposits of adamite have been mined in abundance over the years. Lo and behold, Namibia, a country in southern Africa was listed as having among one of the most abundant sources of adamite! Namibia is known for its deserts and vast jungles and apparently I was witnessing this landscape first-hand! With both of these truly fascinating and mysterious first-hand experiences, it’s interesting that in each case, I did not ask for a specific piece of information, like “where are you from” or “are you masculine or feminine.” Rather, I simply brought the crystals into my energy field and let them do the communicating…and they did so in their own unique way! Here is a technique that I have personally cultivated and feel to be very effective in engaging my crystals for whatever purpose I may have. I have a personal affinity for rainbows. Whether in the sky or in a crystal, I find them intriguing and yes, somewhat magical. Whenever I look for crystals to add to my collection I’m especially drawn to those with little rainbows within their structure. When you see a rainbow in a crystal what you are seeing is refracted light bouncing off of the crystal’s inclusions. As we know, light equals energy and energy equals information, therefore it always made sense to me that a key way to engage a crystal is to tune into the information being emitted from its rainbow ray! Here’s what I do. 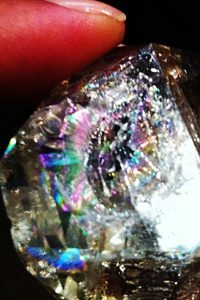 Prior to working with a rainbow crystal (many of which are clear quartz), I will locate the rainbow within its structure. I put the crystal within close proximity to a light source that will illuminate the refractions and show the rainbow. Once located, I then gaze at the rainbow, taking in all of the colors in the spectrum (blue, green, red, yellow, etc.). While focusing intently, I call attention to my heart center (our largest electromagnetic processor of energy) and begin “feeling” the rainbow within my heart. It is absolutely necessary to allow yourself to physically feel within your heart that sensation we get when we have a powerful emotion, except in this case the emotion is directed toward the rainbow. 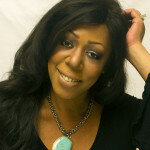 Eventually I can feel a connection being made between my own heart and that of the crystal – this is a very real energetic resonance that is taking place. I will then imagine a thin string of pulsating light connecting the crystal with my heart which ensures the two are in resonance until I finish my session. This helps tremendously when using crystals in meditation or just sitting with them or even carrying them with you during the day. You have made the energetic connection and are now poised to benefit from whatever it is the crystal might have to offer at any given time. As you begin (or continue) your journey with crystals, minerals and stones, I encourage you to work with them consciously and subjectively. In fact, here’s a little experiment you can try on your own (especially if you are new to working with crystals). Get 4 or 5 different crystals, say, an amethyst, citrine, carnelian, rose quartz and smoky quartz. Do not look up anywhere the metaphysical meanings associated with the crystal. The key is to try and determine how best to utilize each different crystal for you! Allow 24-48 hours minimum to work with each crystal. You can meditate with the crystal, holding it preferably in your left hand – which is connected to the right hemisphere of the brain – or simply put it in your pillow case and sleep with it at night. Remember to engage the heart center with feeling as much as possible. Within the 24-48 hour period, try to pick up any impressions you get from the crystal and jot them down. Even if you are not with the crystal for the entire period, you will still get impressions from it as you will be influenced somewhat by its energy field. Do this with each of your crystals. Once you feel confident you’ve received specific impressions (physical sensations, emotions, inspirations, memories, etc.) you can find several resources either online or in a book that will describe what the crystal is said to represent. These may correspond with your personal experience or they may not. Either way, you will have determined how best to engage the crystal for your personal use! As has been acknowledged, not everyone is going to be drawn to crystals for their metaphysical properties. This is a very personal and powerful journey. That is what makes it so special. Is it not natural to look at these absolutely exquisite pieces of Mother Earth and ponder her beauty, wisdom and potential? This earth is rich with flora and fauna and crystals are a central part of her landscape, both inner and outer. Most importantly, in realizing this we also come to realize that the “inner and the outer” are but reflections of one fundamental landscape. If we peer deeply into a crystal with reverence and appreciation we may begin to understand and appreciate some of the deepest and most exquisite aspects that we call our-selves! Enjoy the journey! 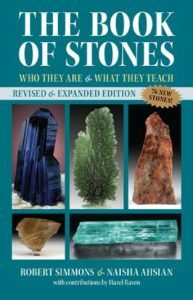 The Book of Stones – Who They Are & What They Teach, Robert Simmons and Naisha Ahsian (This is an excellent reference book with hundreds of beautiful color photos and descriptions of crystals, minerals and stones. 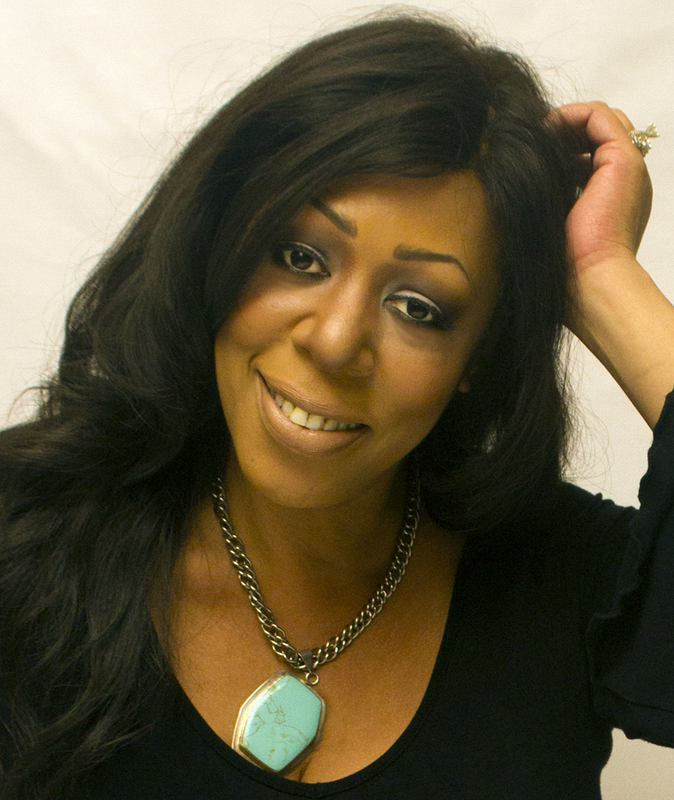 *The Magic of Precious Stones, Mellie Uyldert – The hidden powers of gems, their influence on man, and their connection with magic, astrology, healing and religion. *This title may be a bit difficult to find. Check your local and online book resources, especially those who carry out of print, or used books.